Helping people with computers... one answer at a time. Outlook Express 6 is part of Internet Explorer 6. But if you've moved on to IE7, then Outlook Express 6 can be difficult to locate and download. I need to reinstall Outlook Express, but I can't find it on the Microsoft web site. Where do I get it? Note: this article has been replaced with a major revision. Why? A reader pointed me at new information that fundamentally changed the answer. The new article can be found here. Apparently the answer is "you can't". With the introduction of Internet Explorer 7, Outlook Express has apparently been put out to pasture, at least if you're on Windows XP. Let's look at why that is and what some of your alternatives might be. Outlook Express (OE) was never a stand-alone install. Up until Internet Explorer (IE) version 7, Outlook Express was a component of Internet Explorer. The way to install or upgrade Outlook Express was to install or upgrade Internet Explorer. There simply was no separate download or installation program for OE by itself. But things were even slightly more complex than that. Internet Explorer is part of Windows XP. That means that Outlook Express is a part of Windows XP as well. If you have Windows XP, then you have Internet Explorer and Outlook Express. Which is all well and good until something breaks. More on that in a moment. With the introduction of Internet Explorer 7, Outlook Express was apparently removed from the installation package. You can download IE7 all you want, but there's no updated Outlook Express with it. In fact, from what I can tell there's no way to get Outlook Express from Microsoft at all. Windows Vista users have a replacement: Windows Mail. It's the new version of Outlook Express, except it's available on Windows Vista only. "Outlook Express is dead. Long live Windows Mail." If you're running IE6 on pretty much any operating system, then you have the Outlook Express 6. You can download an Internet Explorer 6 SP1 package, and be as up to date as is possible. If you're running IE7, but not on Windows Vista - there's no matching Outlook Express for you. You probably have Outlook Express version 6, but if for some reason you don't, there's nowhere to get it. The downloads that claim to have it are actually Internet Explorer 6 downloads which should fail to install if you already have IE7. If you're running IE7 on Vista, then you have Outlook Express. It's just called Windows Mail instead. Outlook Express is dead. Long live Windows Mail. For one thing, it's clear that Microsoft has decoupled Internet Explorer from any mail program. I would expect that now not to change. Actually, except for the lack of OE updates for XP users, it's actually a good thing. Windows Mail is the future. But I would expect that updates to Windows Mail will probably happen only if you're already running Vista. I would not expect there to ever be a separate Windows Mail download. If you're running any older operating system, you're pretty much out of luck. It would be nice if Microsoft made Windows Mail available for XP, but I wouldn't count on it. Not at all. What you need to do depends on what problem you're attempting to solve. Many people look for a OE6 download or reinstall when in fact they don't really need it. You're running Windows XP, Outlook Express 6 is broken and you want to install a new copy: Run the System File Checker instead. It will look for missing or corrupt operating system components and replace them. As we noted, OE is part of the operating system, so it's included in this. You may need your Windows install CD. You're running an older version of Windows, Outlook Express 6 is broken and you want to install a new copy: You can download and install Internet Explorer SP1 from the Microsoft web site. As we noted, OE6 is part of IE6 and is included in that download. Back on Windows XP, Outlook Express 6 is broken, the system file checker didn't work, and you still want to install a new copy: Perform a repair-install of Windows itself. OE6 is part of the operating system, and will be reinstalled as a part of this operation. You'll probably need your Windows install CD, and you'll want to visit Windows Update afterwards to make sure you get all the latest patches as well. You're not sure what's broken, you just want a working mail program. Download and run Thunderbird. Particularly if the suggestions above don't work for you, just switch. Thunderbird is free, fairly similar to OE to use, and actually somewhat more powerful. 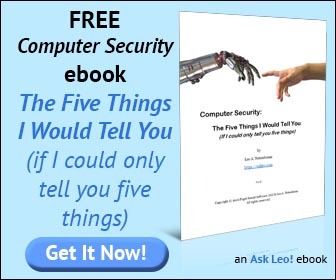 It's free, downloadable, it's being updated, works on Windows XP and Vista as well as the Mac and Linux, and there are many add-ons available for it. In my opinion Microsoft made a big mistake by not providing a way to update Outlook Express when they released IE 7. In an ideal world they'd make OE7, or perhaps make Windows Mail available for non-Vista users. As I said above, I don't think that's very likely. I stand corrected. Thanks to reader Jason Edward for pointing out that something called "Windows Live Mail" (which, when I looked, appears to still be in Beta) looks to be exactly what many people are looking for: a successor to Outlook Express that doesn't require Vista. It also appears to address a couple of problems that many people often request - most significantly downloadable Hotmail. Download Windows Live Mail here. I'll be evaluating it and posting more on it shortly. Leo A. Notenboom has been playing with computers since he was required to take a programming class in 1976. An 18 year career as a programmer at Microsoft soon followed. After "retiring" in 2001, Leo started Ask Leo! in 2003 as a place for answers to common computer and technical questions. More about Leo. You can still purchase Microsoft Office Student and Teacher Edition 2003 at CompUsa if you go online. I had to buy for one of my computers when I found Vista was not compatible with my other computers. You can download "Windows Live Mail", now in full release, on the Windows Live site. I'm running XP with IE7, and Windows Live Mail is working beautifully. I like it much better than OE. Interesting scenario. If the situation warrants Outlook Express, for whatever reason, and you're running IE7, you might possibly try uninstalling IE7 through the add/remove programs applet. That will roll you back to IE6. I'd back up my .dbx files before doing this just to have some semblance of a backup. You might then do a reinstall of IE6 which will reinstall OE in the process. If after all this, your OE is working, then try another upgrade to IE7. You do want to be on IE7 for the enhanced security this program offers over IE6. As Jason Edwards said, I also like it much better than OE - far less spartan! I had an Outlook Express on my old computer but now realised that I can't import my old dbx files to the Outlook or Windows Mail on my new Vista notebook. I had copied my old dbx files to my new notebook. What else should I do? Can yu help me..I lost a lot of my emails that were on my previous system which crashed..I got a guy to retrieve them for me and he has put it on a disc..but because it was on outlook express I am having problems downloading and I cannot see where I can get a programme for outlook express that I can upload on my system and retrieve my very important emails. My budget is tight so i was looking for somewhere where i can download it for free!!. If you have a question, start by using the search box up at the top of the page - there's a very good chance that your question has already been answered on Ask Leo!. If you don't find your answer, head out to http://askleo.com/ask to ask your question. The Tip Jar: Buy Leo a Latte! Advertisements do not imply my endorsement of any product or service.